According to a new study published in the journal BMC Medicine, people who die at home experience a greater sense of peace in their final days than they would in a hospital. Furthermore, the patient’s relatives experience less grief in the months following their passing. Researchers also identified essential factors that should be in place for a person to be able to die at home: The patient needs to have access to homecare assistance during their last three months of life, and the patients and their loved ones must be onboard with the decision. These factors were present in more than 91% of the deaths that occurred at home, according to the study’s figures. For the study, researchers looked at 353 grieving relatives of London cancer patients. Of these patients, 177 died in a hospital and 175 died at home. Each relative was given a questionnaire to fill out that measured the patient’s pain and peace levels during their last week of life. The questionnaires also measured the relative’s intensity of grief. Researchers discovered that almost 25% of patients who died in a hospital experienced very little peace in their final week of living. Comparatively, only 12% of patients who passed at home were unable to find any peace. Furthermore, relatives reported that people who passed away at home didn’t experience more pain than those who died in a hospital. According to the study’s lead author Barbara Gomes, study findings could provide comfort to people who have recently lost a relative or a friend to cancer. Bereaved relatives might receive a sense of closure and comfort from the fact that the patient died more peacefully. Relatives may have experienced a sense of closure because they were able to spend more time with the person in a familiar place. In addition, researchers found that people were more likely to die at home if their relatives had come to terms with the fact that their condition was terminal. 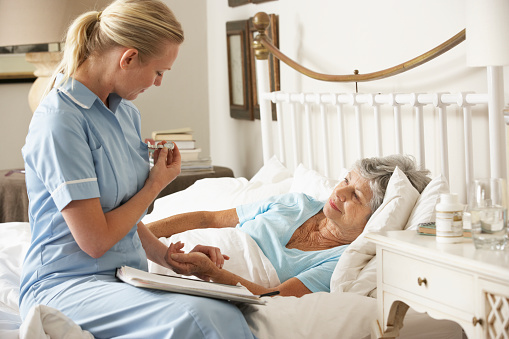 Study researchers suggest that people in the U.S., Canada, and the United Kingdom appear to have sufficient access to hospice care, giving them the option to die at home. People in Germany, Greece, Japan, and Portugal often die in hospitals as there is less support for hospice care in these countries. Don Schumacher, president and CEO of the National Hospice and Palliative Care Organization in Alexandria Virginia, suggests that being at home during a person’s final days of living can help the individual take solace in the life they lived. He notes that people shouldn’t wait too long to have end-of-life discussions with their loved ones. Having these discussions sooner rather than later can prevent misinterpretation down the road. Thompson, D., “Dying at Home Brings More Peace Without More Pain, Study Finds,” Medicine Net web site, October 9, 2015; http://www.medicinenet.com/script/main/art.asp?articlekey=191139.